I’m finally organizing everything from my San Diego Trip and wanted to share with you all one of the hotels I stayed at during my trip there. I’m constantly looking for beautiful hotels to stay at to give you all inspiration for your next trip! So here’s this pretty one and my first stop in San Diego! 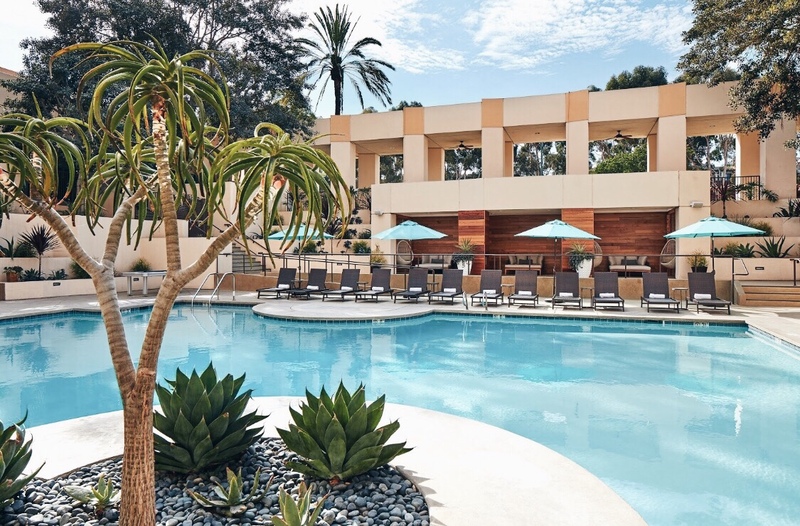 I booked the Marriott San Diego Mission Valley as I was traveling to San Diego Zoo and this hotel was a mere minutes away! So let me take you on a tour of my favorite parts of the hotel and also share with you little bits and pieces of what I think about it! 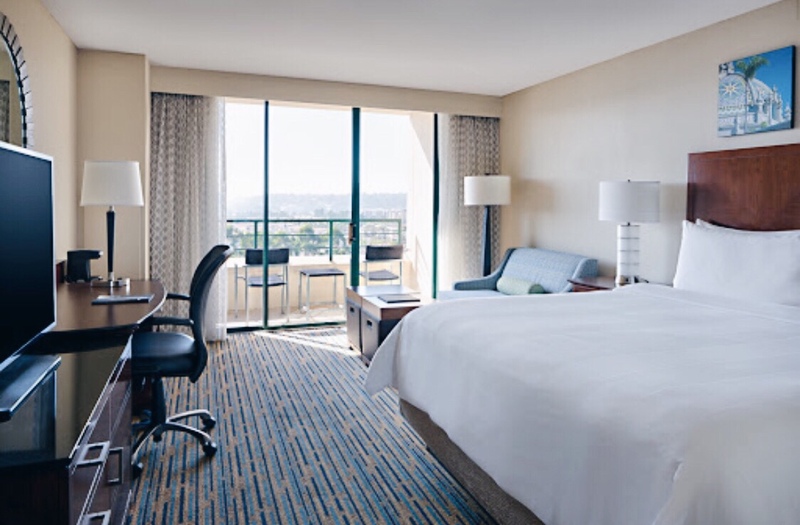 The hotel is conveniently located and is mere minutes from San Diego Zoo area, a ton of high end shopping center, food and Gaslamp District. However, there was a parking fee of $27 per night. But that’s the case with most hotels in the area, so I wouldn’t consider that a con. Upon arrival, the lobby was inviting. The interior design is stunning and definitely my vibes! The staff was accommodating. I did run into some problems with my room availability, but they were able to switch my room the next day. I decided on the hotel, because I was interested in the balcony view of San Diego. The room itself is clean and sleek, but the design was not much to write home about. I was definitely a little disappointed. However, the amenities and everything was decent. It had a smart TV so I was able to easily log into Netflix before I turned in during the night. What I really wanted was the balcony and this is the view from it. The view of San Diego isn’t as stunning as New York, but it’s surprisingly calming. I enjoyed just taking some time and reading here. This is the city view, but there are also rooms with the pool side view. Another big thing about the hotel were their facilities. Relaxing here on a sunny day just seemed like a dream come true! You know, escaping from the winter storms in New York and all! Their pool was also a dreamy escape. I love hotels that offer a resort like experience. It’s really an all in one package. Super relaxing, just swinging by my day! I love how photo worthy all the facilities of the hotel was! Their on site restaurant was also a delight. It’s pretty free during the day, so I easily grabbed a book and sat down with a cup of joe. It’s a great atmosphere to get some work in or just chat and catch up with friends or have a nice lunch. 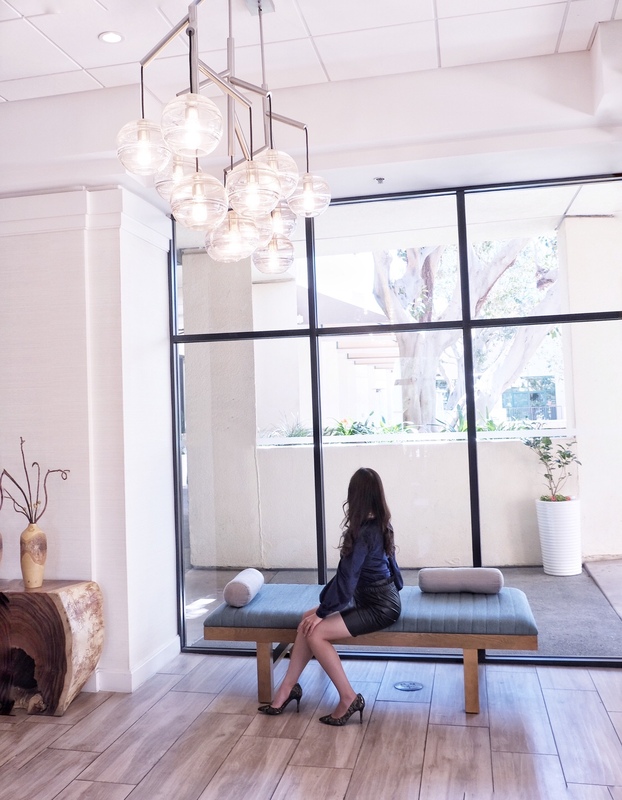 This hotel just makes the best insta-worthy photo opportunities. So modern and so chic. 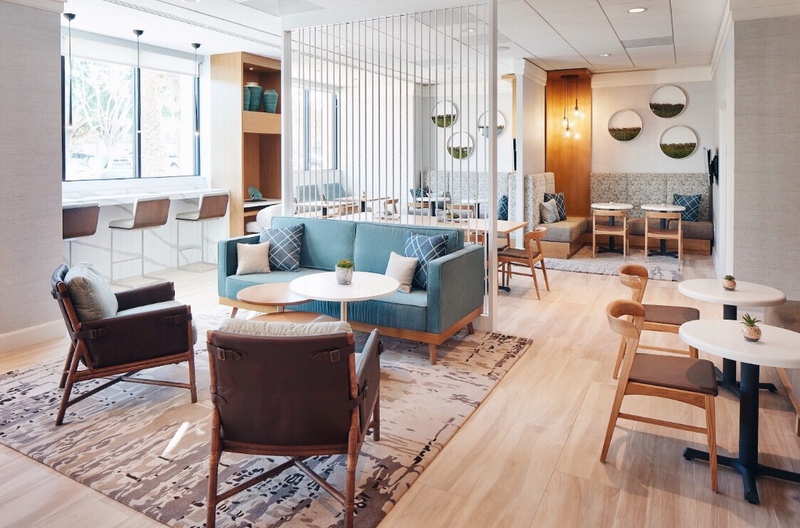 Their lobby’s interior design is super homely and comfortable. I’m just waiting for check out here! Comfortable for the mere minutes I waited for check out! 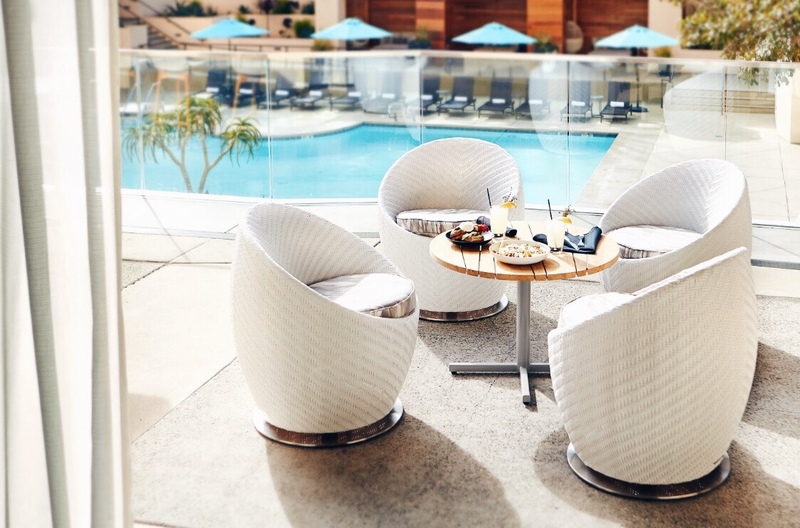 I’e done a lot of research in terms on beautiful hotels in San Diego and I’m happy I got to try this one out. Although, the room interior wasn’t anything to write home about, the facilities and lobby interior design more than made up for it! The overall service and cleanliness was on par and the price was reasonable. 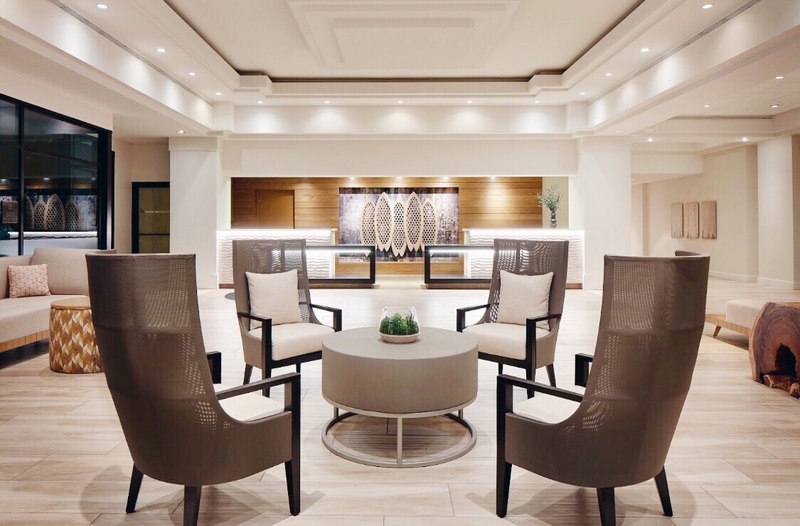 I would love to stay at this hotel again when visiting San Diego, if only to feast my eyes upon their interior design and to use their facilities again! What do you think? Have you visited San Diego? Which hotel did you stay at? Feel free to share! If you have any additional questions, do not hesitate to contact me! Can’t wait to hear from you all! PS: For easy access, FIND and BOOK THIS HOTEL DIRECTLY HERE! Example photo rights belong to Marriott San Diego Mission Valley Press/Media. I absolutely LOVE this hotel! The decor is clean and modern and chic. 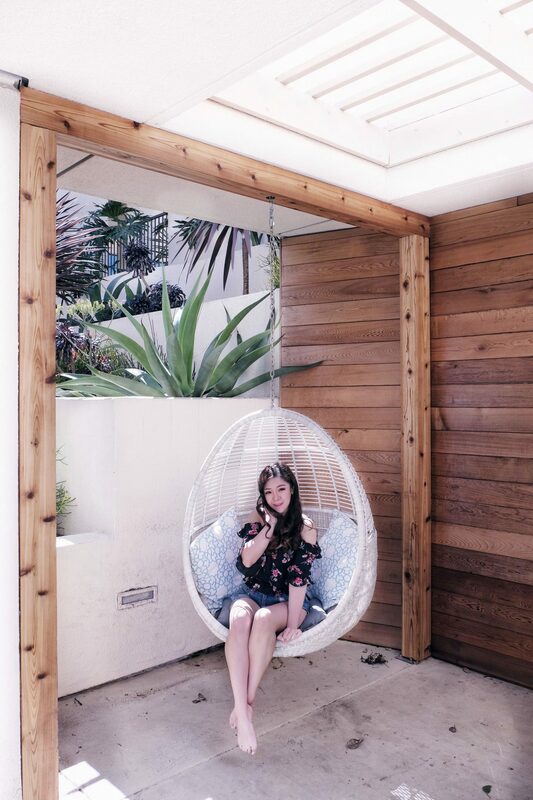 That swinging chair is the most adorable thing! Great review and I have to add this to my places to stay for my next SD trip. Beautiful hotel. Good thing when I travel I usually use uber or shuttle but that parking fee is a bit outrageous! I’m such a deprived housewife, lol. I’ve never had the privilege of visiting San Diego. When I do, I’d love to stay at the Marriott. Looks dreamy. What a fabulous place to stay! I would love to relax by that pool, let me tell you. It’s been ages since I’ve stayed at a lovely hotel like this. Such a beautiful hotel, I would love this for a weekend getaway and the views are breathtaking. This is an awesome looking hotel I love the terrace view and the pool. That pool looks heavenly! I’m totally with you on the balcony. I LOVE when I have a hotel with a balcony and can sit outside and enjoy a different view. This hotel is so gorgeous! I’d love to stay here one day. I love this hotel! It looks so chic, but also like home! The accommodation looks so luxurious! I’ve never been to San Diego but it looks like an amazing place to take a trip!! Oh wow what a beautiful looking hotel to get to go and stay in! I would most definitely love to get to go and see more of the US one day myself and I shall have to think of staying somewhere like this. This hotel looks absolutely spectacular. A trip can definitely be defined where you are staying and this would be awesome. So many photo opportunities at this hotel. It looks like a dream. I could really use a vacation right about now. What a gorgeous place! We will definitely have to check this one out! oh wow! this hotel really makes me want to go on holiday. so many cute stops, so relaxing and beautiful. This is a nice review! Would love to visit one day! What a gorgeous place! Really cozy view and amenities. And you definitely look so darling with your outfits dear, especially that off-shoulder floral top! The aesthetics of this hotel are perfectly aligned with my ideal hotels! Love the seating outside, and the restaurant looks fantastic. I’ll keep this in mind the next time I travel to San Diego! That hotel is an absolute beauty! You are so lucky to have experienced a stay there! Loving all the outfits you wore, too! I’ve been to plenty of Marriotts, but none have ever looked this chic and upscale. Guess its a California mandate. I’d love to relax poolside there. This sounds like a great hotel. It may already have all what we want for a place to stay in. I agree, it is Instagram worthy. I’ll be sure to check this hotel out next time I’m in San Diego!